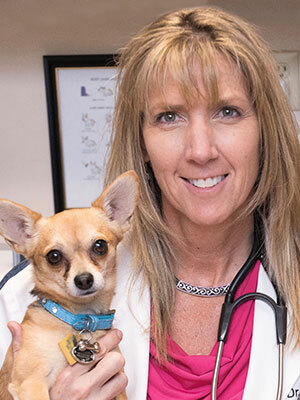 Dr. Kelly Moffat earned her Bachelor of Science from Arizona State University and received her Doctorate in Veterinary Medicine from Colorado State University in 1993. She stayed on at CSU to complete a Small Animal Medicine and Surgery internship. She joined Mesa Veterinary Hospital in 1994 and later joined into a residency program in Veteinary Animal Behavior and passed the certifying exam in 2004. Dr. Moffat has since been the Medical Director at the VCA Mesa Animal Hospital and because of her interest in the human-animal bond and internal medicine, still enjoys keeping an active general medicine practice in addition to the behavior consultations. Dr. Moffat is also an adjunct faculty member, lecturing to the veterinary medical school at Midwestern University in animal behavior. As a general practitioner and veterinary behaviorist, Dr. Moffat has the unique perspective on working with day to day general practice cases who are difficult with the staff. Learn some tips to help get these patients through those quick appointments in the least stressful manner.